Lee Dae Won (18 year-old, 1.93 m, 168 kg, Hotoku Gakuen High School) was beaten last year in the finals by the young Yamaguchi. This time he won and so he became the ‘High School Yokozuna’. This Japanese rikishi with Korean origins won in the finals against the clear favourite, Takayuki Sakuma (who had won almost every other important tournament this year). In addition to his impressive physical skills, Lee has an excellent technical basis, and is considered to be a very promising rikishi. He has already joined the Kasugano beya and will be in mae-zumo as soon as this Hatsu basho. His ‘dan’ was not high enough to enable him to participate in the national amateur championships, and so he has had no opportunity to fight against the best college wrestlers before entering ozumo, which is unfortunate. Tatsunori Kokumae (1.84 m, 140 kg, Tottori Prefecture Physical Fitness Association) is the 2006 ‘Company Yokozuna’. This title would normally entitle him to join Ozumo at the rank of Makushita tsukedashi 15. But Kokumae, a former Nichidai student, is too old (25) to join Ozumo. Middle weight: Yoshida (Japan) — 3rd world champion title in a row. Heavy weight: Byambajav (Mongolia) — The clear favourite, Mori, had previously lost against Karaev, from Russia, in the semi-finals. All categories: Gabaraev (Russia) — He beat the favourite, Ichihara, in the semi-finals. Teams: Russia, won 2-1 against Japan, putting an end to Japan’s five year’s winning streak! After these Russian feats, the lively wrestler Alan Gabaraev (22, 1,88 m, 127 kg) will join the Mihogaseki beya, which recently lost all of its talented rikishi after the creation of the Onoe beya. First great title of the year for Takayuki Ichihara (1.82 m, 165 kg, 4th year student at Nichidai), who won against Yuya Morishita (from Tokyo Nogyo) in the finals. This will guarantee him a rank of Makushita tsukedashi 15 for his debut in Ozumo. 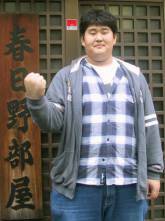 Mori (1.82 m, 150 kg, 4th year student at Nichidai) became the 2006 ‘College Yokozuna’. This victory will enable him to start Ozumo at the rank of Makushita tsukedashi 15. At last, here was a great title for this exceptionally gifted wrestler who has always placed highly during the last few seasons, (notably, he was a finalist in this same competition last year, when he was beaten by Shimoda using a henka). Among the last sixteen in this Championship, there were seven members of Nichidai. This was tough for Morishita, because after his failure in the finals of the A-category championship he lost again a decisive bout against Ichihara! Ichihara is therefore the 2006 ‘Amateur Yokozuna’, which will give him a rank of Makushita tsukedashi 10 for his debut in Ozumo. Lee Dae Won: Kasugano Oyakata predicts that he will become no less than a yokozuna. The competitiveness in such a dynamic heya should enable him to progress quickly, but he must not move up the ladder too fast. His performances against a very tough opposition in Mae-zumo (January) and then in jonokuchi (March) will already be interesting to see. Gabaraev: Although rather light, this rikishi has beaten the great Ichihara twice during the world championships, to get individual and team gold medals. He will participate in Mae-zumo in January too. Mori: By achieving the prestigious title of College Yokozuna, he is eligible for the Ozumo rank of Makushita tsukedashi 15. But he shows some signs of weakness. He seems to depend too much on his left mawashi grip and to be vulnerable against a dynamic oshi-sumo. Sakuma: This solid 18 year-old hope, (1.86 m, 140 kg) was the leader of the famous Saitama Sakae High School this season (notably this is where Goeido and Ichihara came from). During his superb season, he reached the quarter-final of the national amateur championships. He is expected to bring some glory days to Nichidai during the coming years, and he is expected to get many titles at the College level before taking the plunge and joining Ozumo. And the other ones: Let’s mention the amateur championship finalist Fukao (1.82 m, 190 kg, and still one year to spend at Nichidai) and his powerful teammates Minami and Yamamoto (the heaviest recruit in Ozumo’s History at 233 kg!) who will join the Onoe beya. Also their are the two prodigies from Tokyo Nogyo, Tanaka and Morishita, and the high school phenomenon Yamaguchi, still there. A great thanks to Joe Kuroda.